The Royal Society, now the national academy of science of the UK and the Commonwealth, was founded in London in November 1660 with the idea of promoting "physico-mathematical experimental learning". Its founders included Sir Christopher Wren (1632-1723), Robert Boyle (1627-91) and John Wilkins (1614-72), and its first Curator of Experiments was Robert Hooke (1635-1703). The history of science in the UK is tied closely to the history of the Royal Society and its fellowship of eminent scientists, engineers and technologists. By Smeaton's time, the Society occupied two houses in Crane Court, off the Strand. Smeaton attended its meetings regularly, and presented his first paper there  concerning improvements to the mariner's compass (in association with Dr Gowin Knight)  in July 1750. He presented three papers in 1752. The first (April) describes his work on the air pump. The second (June) covers ship-tackle pulleys. In November, he presented a collaboration with Benito de Moura Portuga (1702-76) of Lisbon, on improving Savary's steam engine. This prolific output must have helped Smeaton's candidature for Society membership, and on 14th December 1752, Lord Charles Cavendish submitted a proposal for his election, citing his abilities in mechanics, mathematics and natural philosophy. He was supported by William Watson (1715-87), John Ellicott, Gowin Knight, James Short (1710-68) and three others, and was elected as a Fellow on 15th March 1753  a few months before his 29th birthday. Although Smeaton continued to develop scientific instruments and delivered two further papers in that field in 1754, he was also working on the design of mills. This is the topic that would lead to the Royal Society's ultimate accolade. 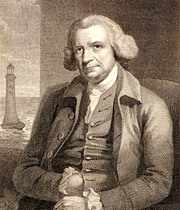 In the meantime, while constructing Eddystone Lighthouse (more on that later), Smeaton's observations led to another two papers in 1757-58, on the effects of lightning and differing air temperatures. In 1759, after seven years' work, Smeaton published his findings on the power of water and wind to turn mills. It describes various experiments on models, the results of which he later applied to real mills. One thing he found is that an overshot waterwheel, where the water feeds in at the top, is almost twice as efficient as an undershot one, where the water feeds in at the base. This paper was so well received that Smeaton was awarded the Society's highest honour, the Copley Medal, presented to him on 30th November 1759. Smeaton was fascinated by astronomy. However, his interest in instrumentation had not diminished, and he wrote about a new hygrometer and also produced a seminal piece on the precise graduation of astronomical instruments, read to the Society in November 1785. In between, his engineering work prompted two mechanics papers concerning the power required to give velocity to heavy bodies and experiments on the collision of bodies. During his time as a Fellow of the Royal Society, Smeaton had his portrait painted many times. The first dates from 1859, when he was painted by his friend and contemporary Benjamin Wilson (1721-1788), himself awarded the Copley Medal in 1760 for his "many curious experiments in electricity".